San Diego, California. September 17, 2014 – NASA, Orion prime contractor Lockheed Martin and the U.S. Navy continue to perfect techniques needed to recover Orion from the Pacific Ocean when it splashes down at the end of the spacecraft’s first flight test in December. Recovery tests began on September 12 and will continue until the 19th. During recovery testing miles off the coast of California, teams are performing a full dress rehearsal of the primary Orion recovery method and practice a backup recovery technique. The USS Salvor (T-ARS 52), a safeguard-class rescue and salvage ship, headed out to sea September 12 for four days to first test the backup recovery method, in which the recovery teams will use a crane attached to the Navy ship to retrieve a test version of Orion from the water. The team started in calm seas and is testing its way through more challenging waters to determine recommended weather and sea condition limits for crane recovery. On September 15, the USS Salvor rendezvoused with the USS Anchorage in the open sea to hand off the Orion test vehicle. During testing on the USS Anchorage, the team will conduct a full dress rehearsal for Orion recovery, ahead of its December flight test, of the well deck recovery method. That option involves the spacecraft being winched into a flooded portion of the naval vessel. The end-to-end test will include Mission Control Center support from NASA’s Johnson Space Center in Houston, weather balloons, two Navy helicopters, four rigid hull inflatable boats and two Zodiac boats. 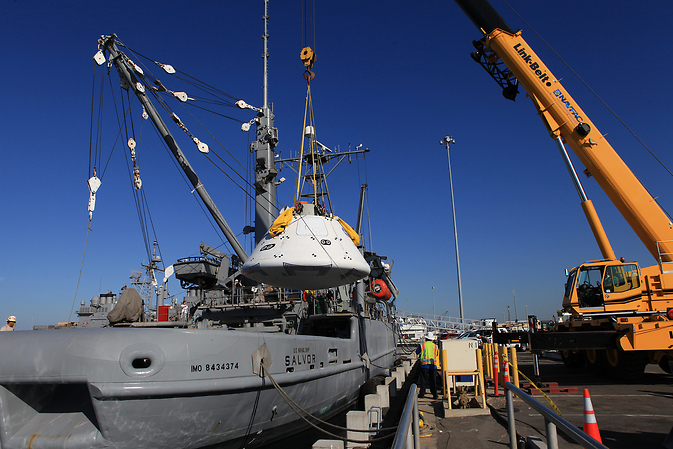 At the conclusion of the test, September 19, the USS Anchorage will return to Naval Base San Diego where the Orion test vehicle and support equipment will be offloaded.